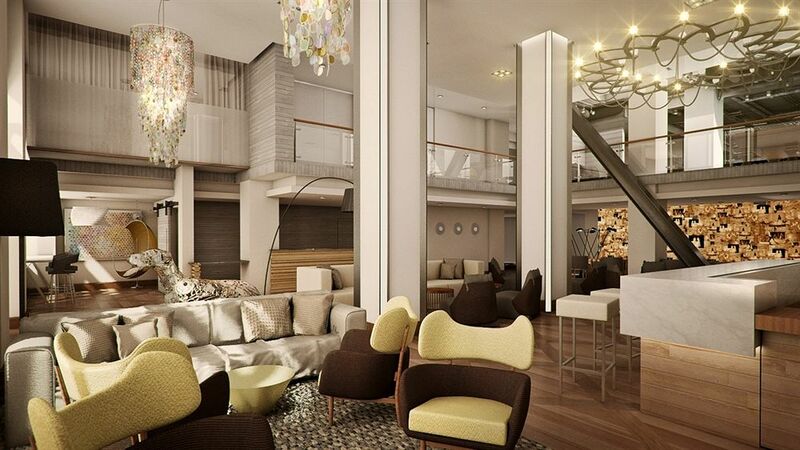 The Viceroy Group have turned out a fabulous addition to their name with the Zetta Hotel. Sometimes it is hard to get it just right with SF hotels. You can end up either on the very traditional old fashioned side or the way too urban side with your selection. I have been to San Francisco many times and have always played it safe with the large hotels and the Union Sq established set or the very trendy… so trendy in fact that it looks totally unfinished with all focus being on the Zen of the room… Bore. Off. This place is fun. I mean actual fun.The lobby is lively, young and loud from the get go and there is a fabulous bar right as you walk in. Its literally like it is encouraging you to have fun and be sociable. For those who think that 12pm is too early to hit the French Martinis (it is not), there is a games room (The Playroom) in a gallery overlooking the lobby and bar, complete with a GIANT connect 4… except using footballs… and instead of connecting 4, you have to aim for a basket below… You may or may not get the drift, but its fun and its called the Plinko Game wall. On arrival, evidently barely conscious after nearly 24 hours travelling (from London-LA-SF)… the wonderful concierge looked at me, pointed to the couch in the bar and said that she needed nothing from me but my passport and my drink order. She took care of literally everything and by the time I was half way through my drink, I was checked in with my bags in my room, some food ordered upstairs and the car parked in the carpark. She was On It. The rooms are slick and modern and mine had a ‘floppy disk portrait’ art feature that I fell in love with. They feature three hanging over-bed lamps that are suspended by old bike-pump looking rope to give a cool and urban feel. My first night after a 3am wake up, an 11 hour flight, then immediately driving 8 hours from LA (traffic) and arriving at half past midnight, was spent in the room with roomservice treats and honestly… it was a happy night. The bathroom is effortlessly cool with bookshelf print wallpaper that I would like to steal for myself had it not been pasted onto the walls. One particular bartender was a fabulous blonde woman who knew everything there was to know about every drink, wine and which bars were the best. She was well travelled and charismatic. She seemed to know everyone and was clearly a major draw into the bar which on a Saturday night, was buzzy and full without being too much for a hotel bar. If you like a breakfast (and I am obviously partial to a poached egg), then The Cavalier is the hotel restaurant and is an “upscale British brasserie”. Its a real treat for a morning stop off and if you like Tea (I do not), then they carry an array of teas including old British favourite Earl Grey. I find all tea tastes like Coffees meek and mild mannered cousin and so went for a flat white. Their coffee iss good. This place is perfectly placed just outside the equivalent of every cities tourist traps and pick-pocket central. A 3 minute walk to Union Square, a 7 minute walk from SoMa, a 10 minute ride from The Mission District and/or Castro and 20 minutes from Fishermans Wharf…. without actually staying in any of these places. This my friends, is a fab place to be.